There were a lot of things that we wanted and planned to do in 2018, laid out between our New Era Roadmap and our Roadmap 2018. There are goals that we did meet, but not everything was done – and of the things that were done, some of them worked, some of them didn’t work as intended, some of them took far more time than expected, and some of them impacted game development in ways that we didn’t expect. In a lot of ways, we were too optimistic about some of our plans, and some of the new ventures for the studio took far more work than expected. We’ve been reflecting on exactly what did and didn’t work last year, and the obvious and not-so-obvious lessons learned that we can take into 2019. We were able to bring Battlerite to new regions last year, and that was one of the projects that was much more of a massive undertaking than expected – on both a technical and cultural level. The “hard and time-consuming part” of this was wrapped up last year though, and we’re now able to include these regions in future Battlerite plans and projects. We organized, launched and experienced running a professional esport league spanning multiple regions while attempting to perfect the balance of the game and thus the competition of our league. We eventually had to take a step back from this approach, and are looking into more sustainable ways to bring tournaments and competition to our games, but it gave us a lot of experience and perspective on what a league system needs to operate successfully. We’ve also added new Champions, and began filling out the stories behind them in our Book of Lore, and that’ll continue through 2019. The lessons that we’ve learned aren’t being taken in a vacuum. The goal of 2019 is to adapt how we work, specifically to give us more freedom to make significant changes to the Battlerite games. And we think we’ve made the right adjustments for this to happen in 2019. Keeping these lessons in mind, we’re going to be working on Battlerite as a whole this year – both Arena and Royale. 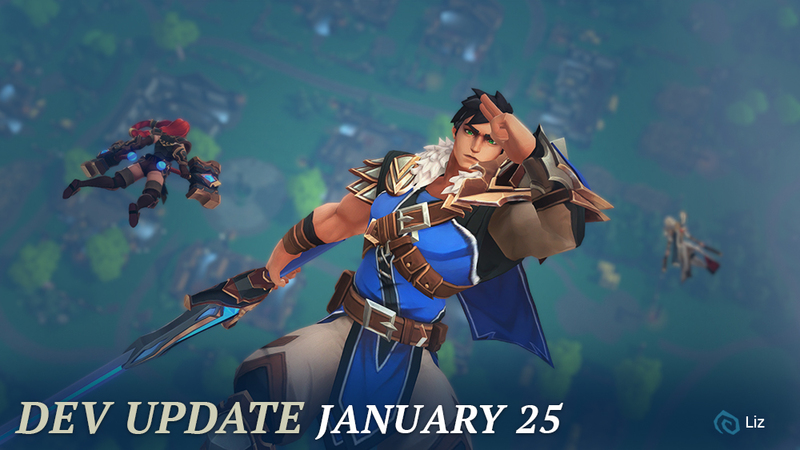 Battlerite Royale will be launching in the first quarter of 2019 – though we’re not announcing a release date today, it’s probably a bit sooner than you may think! As soon as Royale is free to play though, we’ll no longer be switching back and forth between the two games but will be focussing on both. There will be a Big Patch™ for both games to go along with Battlerite Royale’s Free to Play launch that will shake them up quite a bit. Keep an eye out for that announcement, as we’ll be making another Dev Update to go over some of the nitty-gritty features and changes. The Tournament System is still absolutely in the works and one of our priorities and we’ve committed to completing it. It is delayed, but it’s not something that we have any intention of dropping. Currently, the plan is to have a small-scale test of the simplest version before the Battlerite Royale free to play launch and before the aforementioned Big Patch™, though it will not be included in the Big Patch™. But first, Lunar New Year! Lunar New Year will be starting on the 30th, and Patch Notes for it are scheduled to be published on Monday, January 28th. 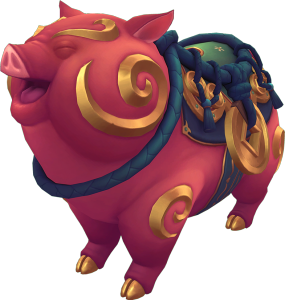 This will be a smaller event, as we’re focussing on the aforementioned Big Patch™ that goes with the Battlerite Royale Free to Play launch, but what those patches WON’T have is a super adorable chonky pig mount. Fun fact: round animals are the best animals. Make sure to get your piggy before Lunar New Year ends, we’re excited about what’s coming to Battlerite and Battlerite Royale for this year. We’ve been making changes to both how we work internally, and are putting the pieces together to make both games a more community-driven experience to take part in. Thanks for the support over the last few years, and we’ll see you in game!